Doctor Who: Establishing The Sontarans In New Who | Warped Factor - Words in the Key of Geek. The Sontarans were a fantastic idea from day one. Robert Holmes channelled an everyday frustration through a science fiction imagination, taking not only the petty warmongers of an era scarred by Vietnam but also every tiny-minded bureaucrat and parking attendant you’ve ever encountered, giving them a gun and advanced technology, and setting them loose in the universe. A pastiche on militarism, bureaucracy and implicitly on machismo, the Sontarans were simply brilliant from the moment Kevin Lindsay’s Commander Lynx stepped out of his (and let’s drive the machismo point home here, shall we?) ball-shaped spaceship and claimed the Earth and all its moons and satellites for the glory of the Sontaran empire, with his little, pathetic, fold-out flag as the ultimate undercutting of all the militaristic gadget-boy might the Sontarans embodied. Sadly then, in Classic Who, they were never that effective again, dogged by rushed storytelling and small budgets (The Sontaran Experiment), by bizarre performances (The Invasion of Time), and by a sad but inevitable lack of need to be there (The Invasion of Time and Holmes’ own Two Doctors). But part of the inevitable call of a rejuvenated show like New Who is the demand from fans to ‘bring back the oldies’ to fulfil the fannish imagination-dreams of stories with the great old aliens, but with budgets. The show had relaunched with a modernised retelling of Spearhead From Space, Holmes’ biggest other creations, the Autons and the Nestene Consciousness setting the show off on the right foot, running. The Daleks had been a signature success in their New Who incarnation, all bronze and full of tricks. The Cybermen less so, but we saw where the logic of their redesign came from. 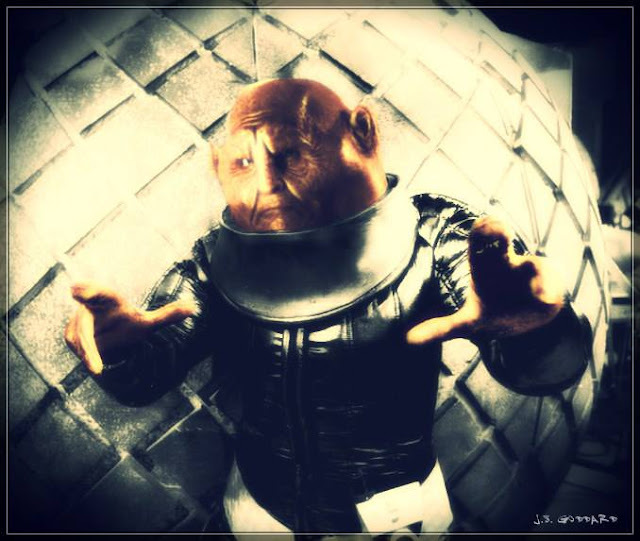 It shows how highly at least their potential was regarded that Series 3 saw the next great villain make a return, and that it was the Sontarans. The Sontaran Stratagem and The Poison Sky would also see the return – the proper return of UNIT, so it was a big, high stakes story in many ways. So does it work? As a story, and as a re-hatch for the clones from Sontar? As a story, it taps into a couple of modern fears – the slight paranoia about GPS and the notion of self-driving cars (if they drive themselves, do they go where you want them to, or where they want to? ), and the idea of man-made pollutants clogging up the atmosphere and turning it into an unbreathable fug that will kill us all. Helen Raynor’s original idea of big factory chimneys belching the pollutant out was reasonable enough, but by making The Sontaran Stratagem into The Satnavs of Death, Russell T Davies borrowed one of Holmes’ other great tricks – making the mundane utterly terrifying. So Satnavs of Death – big tick on the plotting and themes. UNIT returned, looking like UNIT had never looked before, which is to say credible and prepared, not having to scramble for a Jeep or two, a rocket launcher or a helicopter as and when it needed them but fully prepared and ready for action. There was the return of Martha Jones too, giving us an answer to What Martha Did Next and a slightly forced, slightly desperate idea of happy ever after for her, as well as giving Freema Agyeman the chance to show off a broader range by playing Martha’s evil clone. Rupert Holliday-Evans played Colonel Mace with an attractive combination of vexation and good sense that echoed early Nicholas Courtney, and could well have seen him develop as the face of 21st century UNIT, but unaccountably didn’t. And there’s a breathless pace to the whole thing that only sags here and there – right from the pre-credits, and Agyeman’s portentous to-camera “I’m bringing you back to Earth,” there are mysteries to solve, and the two-parter barely lets up – one mystery becomes another, becomes another – ATMOS built by child prodigy? No, must have alien help. What else is in it that makes it dangerous? Why gas? Why the Martha clone? Why the Sontaran attack on the factory? Why Luke and his Rattiganettes? Why? Why? Why? The story makes sure it lays its curiosity-hooks good and deep, and it does that most important thing – it actually gives them what at least sound like rational answers as it pulls us through, becoming, in addition to everything else, a chance for Donna to tell her Grandad how it is, travelling with the Doctor, and for her to be like us, potentially clueless on the Tardis, not knowing what to do, and to rise above her fear and earn her companion-stripes all over again. Watched again as a story some eight years on, it still works. Yes, arguably, all its story-strands are fairly forced, fairly “Ooh, look at me – STUFF’s happening!” but that’s part of the nature of the drama – it only tunes you in when there’s interesting stuff to look at, and The Sontaran Stratagem and The Poison Sky are interesting all the way through, building a coherent and exciting story with more than its fair share of air-punching moments. 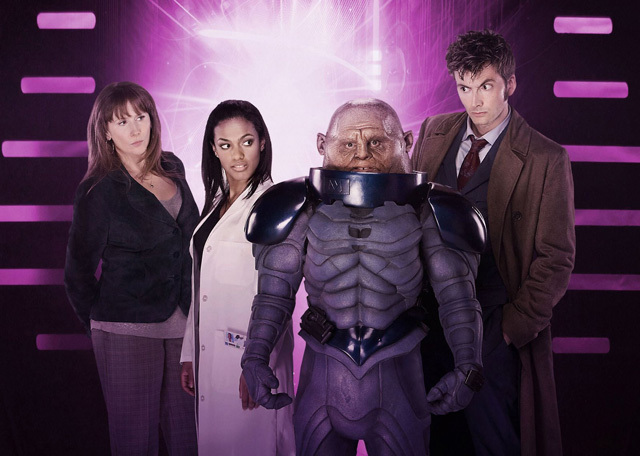 Uniquely among Sontaran stories in New Who, it still stands up as a great ride. What then of its credentials as a story establishing the Sons of Sontar in the world of New Who? Well, there are things it needed to do to make the Sontarans viable. Firstly, in homage to the old days, it had to have the shot of a Sontaran removing his helmet. It had to have a coherence of performance. It had to have at least two Sontarans in ‘open-face’ and it had to make some sort of good use of them. For their great schtick of being the most impressive warriors in the universe, we’d never seen them doing the proper work of war, they’d mostly been seen in ones and twos, stomping around the universe being grumpy and not-fighting (that’s not-hyphen-fighting). So seeing loads of them would have been great, and having them actually fighting someone would have been better. 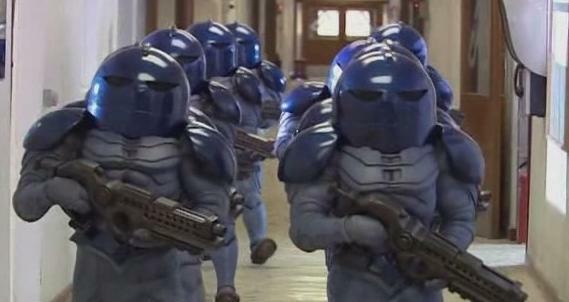 In the end, we got all that and more – we got a shipfull, squadrons full of Sontarans doing proper Sontaran things. The make-up was superb in terms of making them believable – a serious issue in itself after The Invasion of Time and particularly the masks in The Two Doctors. We got two ‘open-face’ Sontarans, Christopher Ryan and the then-new to us Dan Starkey, giving different but coherent performances. 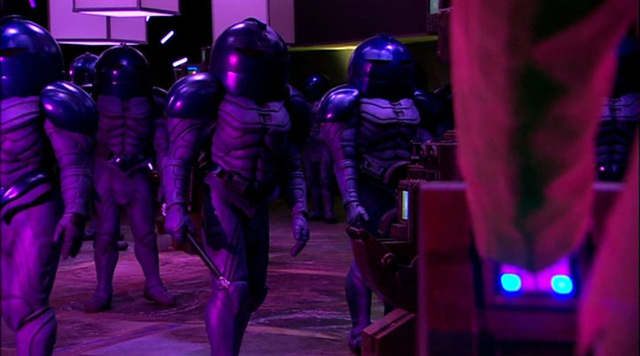 We had Sontarans with serious weapons rather than the tiny glowing erection-substitutes with which previous generations of Sontar’s finest had been equipped. We got to see the ship into which all those ball-ships fitted, and it too was excellent, looking like something deeply sado-masochistic and leather-studded (Raynor and RTD adding their own kick in the groin at overt machismo, maybe?). Best of all though, for once, the Sontarans grew. They grew in terms of being rounded characters – Stahl’s epithets of war showed the kind of belief-system in which the clones were grounded, the laughter of both Stahl and Skorr, and the interminable Sontar-Ha haka gave us an idea that the species was ready to take its place as a fully-rounded creation, rather than a plot-serving bunch of grumpy spuds. It gave us an idea of – for the want of a better phrase – Sontaran culture, which had always been missing in previous stories, even from Holmes himself. Was it perfect as a vehicle for bringing the Sontarans to New Who? Maybe not – the rubberised space armour didn’t have the appeal of previous generations of Baco-Foil outfits, and the blueness of it was mostly underwhelming. Come to that, it didn’t seem to work especially well as armour once Colonel Mace and his mob were able to fire at it. But as a way of adding the species to the New Who universe, cool-looking shipfulls of Sontarans, strong performances from both lead Sontarans, make-up that made the demented shape of the Sontaran head look like much more than a mask, the Sontarans going to war, and a sense of the macho, self-aggrandising cultural loops a species like the Sontarans would go through was absolutely the way to take them, and works beautifully. 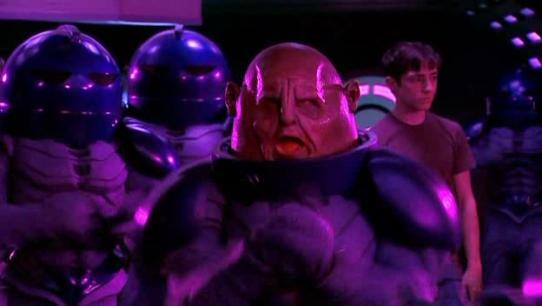 While this Sontaran fan’s heart will always belong to The Time Warrior, The Sontaran Stratagem and The Poison Sky takes them more seriously as a species than any other Sontaran story before it, priming them to be a great New Who villain, while still shoving its tongue firmly in its cheek. The fact that they’ve never been used to any serious effect since proves, if nothing else, that The Sontaran Stratagem/The Poison Sky has been a hard act to follow without tipping the comedy into the territory of blatant stupidity (as in The Time of the Doctor) or the odd couple (Strax being a very different Sontaran even to Starkey’s Commander Skorr). Give it a spin today and remember a story that deserves to be thought of as a modern classic.